Young Electric has partnered with many clients to fabricate and install complex custom industrial control panels. We’re well known in Kansas for our expertly designed industrial control panels. All panels are UL 508A certified with complete documentation. Our professional electricians have custom fabricated many types of electrical control panels. Your harsh industrial environment requires reliable control panel performance. Our team of electrical professionals has the expertise to build your next motor control panel to meet your application demands whether it’s low voltage or smart user interface. These fuse holders lead to critical manufacturing instrumentation and demand precise, detailed and organized labeling from Young Electric’s professionally trained automation and controls experts. Industrial manufacturing processes which require digital automated processes are used in many different industries. While their use may be common, we understand your specific needs may not be. 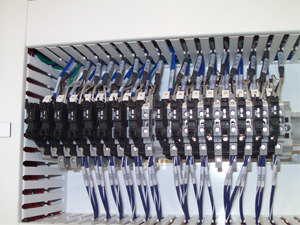 Our expert electrical engineers are ready to custom build your next PLC panel. Simplify application operation for your industrial controller. Human Machine Interface (HMI) panels afford you the ease of use and provide the data you need to make educated decisions about your manufacturing operations. Pneumatic control panels allow controllers in industrial and commercial applications to easily control all cylinders and actuators in compressed air and fluid instances. Eliminate interferences and down-time with a Young Electric custom fabricated industrial hydraulic control panel. From design to fabrication to implementation, our team is here to serve your industrial electrical needs, made to your specs. As Wichita’s safest electricians, we fully understand the importance of protecting your electrical equipment from hazardous environments. You can count on Young Electric to consider the safety of your employees at your industrial facility first when designing a custom control panel. All our control panels are rigorously tested and include training and basic troubleshooting. Let’s talk about your next industrial electrical project.